Liverpool starting XI: Mignolet, Clyne, Toure, Sakho, Moreno, Lucas, Henderson, Can, Milner, Ibe, Firmino. Right, we are done and dusted here. I'm off to go put Final Score on and make sure that the final score was 5-4 to Liverpool, and then possibly lie down in a darkened room. What a game, both brilliant and terrible. Head on over to our main live text commentary page for all the reaction. Norwich striker Steven Naismith: "Defensively it was very poor and that is what cost us. If 11 men can't defend their goal for two minutes, then you will get punished." 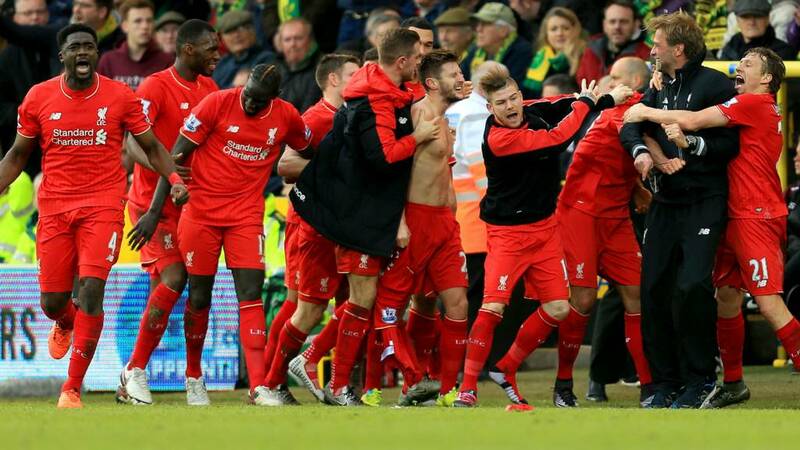 Richard: If that game #NCFC v #LFC isn't top of the Match of Day running order, I'll eat my hat! What a game. Tomiwo Akinbowale: This is far from a CLASSIC. This is Shambolic defending at its shambolic best! Liverpool matchwinner Adam Lallana, speaking to BT Sport: "A strange afternoon. I was just delighted to get the three points in the end. When they scored you just think it was going to be one of those days. A massive three points for us. "That [scoring] was one of those moments in your career that just happens, you go with your flow." Liverpool midfielder James Milner: "It was ridiculous at times. To show the character to come back, and then the disappointment of conceding in stoppage time, it would have been easy to roll over but we went again and got the result. "The potential is there, we have shown that, we just need to do it more consistently." Adam Lallana and James Milner had to double check at the final whistle what the full-time score was. Crazy game. "It was awful defending but you have to finish the chances and the players did. It was a special day for Liverpool and the fans. "Klopp, wow, he did not expect that." There's some Norwich fans smiling in the stands. I bet it won't be until they get home and crack open a beer when the realisation that their side actually lost that game sets in. I cannot wait for Jurgen Klopp's post-match interview. James C: This one game of football has had more excitement than my entire 2015. "Absolutely extraordinary. I didn’t expect it. I thought we had enough. Emre Can had two bites at it and when it falls to Lallana he smacks it into the ground and the goalkeeper can do nothing." Thargu: This Liverpool Vs Norwich game is ridiculous! Absolute roller-coaster even for the neutrals! Felix Roberts: What is happening!!!!!! Adam Lallana!!!!!!!!!! David Simpson: WHAT is going on?!?!? Jurgen Klopp celebrated that dramatic winner so vigorously that he broke his glasses. He won't care though as the full time whistle goes on a memorable game. What a seriously crazy, topsy turvy, unbelievable, brilliant game as Adam Lallana volleys in first time after a poor clearance by Norwich. "The oldest one in the book. Just lump it up there and get the bounces that come down. "It landed at him on the 18 yard line, what a hit." Norwich pump the ball long and defender Sebastien Bassong is up on the edge of the area where he lashes home. A strike any forward would feel proud of. Surely, that's it for the drama? "Norwich haven’t really got a head of steam up. There is a real negativity around a lot of their players who seem to lack confidence on the ball." Five minutes of added time go up on the fourth official's board as Norwich push forward. It ios the final few minutes and it is that time again,. Steven Caulker is coming on BUT unlike in recent games it looks like he isn't being stuck up top. The defender could be playing in defence. Jurgen Klopp hugs him and smiles as he passes him some instructions, before Alberto Moreno makes way for Caulker. Michael Healy: This has been microcosm of this PL season in the space of 90 minutes. Exciting and unpredictable, but lacking any real quality. Matt Flecknoe: Imagine if Liverpool could defend, we might actually get somewhere near the top four! Malcolm Melling: This isn't Klopp's team. Big changes at the back in the summer, and up front. Then we can start to judge his management.